It’s better to be late than never. Yep, I’m grateful because I’m given the chance to watch the first episode, and here I am! Honestly, I’m hesitating to start watching because I’m afraid I won’t be able to balance it with my studies. But then, after I watch it, I’m totally hooked. I’ve never laughed so much like this since My Girl and this could be my mood lifter for a new week. Plus, Jang Na-Ra is one of my favorite actresses for rom-coms, and there’s Daniel Choi too. So why not? A brief synopsis: This drama is a story about an old maid named Lee So-Young who has a very baby-like face. She’s 34 years old and the breadwinner of her family. Fate brings her to meet with a young Managing Director (MD), Choi Jin-Wook and they had some bitter experiences with each other. One day, she substitute her sister for a modelling job, at a fashion company and subsequently using her identity there. She encounters Jin-Wook and ends up working together with him in the company with Ji Seung-Il as the president and Kang Yoon-Seo as the designer there. What will happen if her real identity is revealed and the secret she’s holding is made public? The show starts with Lee So-Young (Jang Na-Ra), truly proud of her super baby-like face despite her age, but then, not everything could be beauty even if you have a young face.. Fate starts to turn away from her when she is fired from the fabric company that she has been working at for the past 14 years. The reason? The company is currently laying down some workers and because she has pretty young outlook, she will have no difficulties to find another job. Yeah, as if every company wants young-looking woman but with actually older age. Miffed (and drunk) with this, she tries to plead the boss, only to find that she is replaced with a young girl. Life has never been more hurtful with its truth. Swaying from her drinks, she heads her way to her home. While emptying her stomach, puking at the street, she muses over the SNSD’s poster in front of her. How they are young and rich (and slim, and long-legged, the list is never going to end) and they must be happy, leading a better life than her. She goes to her mother’s stall and sadly stares at her. The next morning, So-Young wakes up early, only to find herself jobless now and it is meaningless to wake up so early. She looks at the resume that belongs to her sister, Lee So-Jin (Oh Yeon-Seo) who is still sleeping there and thinking how nice it is to be so young. Aww..pity her. Then, the scene moves on to a fashion company, ‘the style’. Everyone in the company is in a hurry, and here comes the next limelight stealer, Choi Jin-Wook (Daniel Choi), frantically searching for something while talking to someone on his mobile. He goes on his feet hurriedly to a fashion show and helps with the preparation (actually searching for a bead). Suddenly, a model comes and steps on the bead, sending it rolling farther away. Jin-Wook chases it and gets his hand on it..
..and realizes that he is at the entrance of the runway, with everyone’s eyes on him. Totally being at the wrong place at the wrong timing. He stands there, agape. At this point, everyone has started to ask what is happening, with President Ji Seung-Il (Ryu Jin) and Managing Director Hyun Ji-Sook (Na Young-Hee) looking so worried about their company’s reputation. Jin-Wook, unable to do anything, asks his colleagues, and he misunderstands their hand signs. Instead of going back to the backstage, he gets on the runway and starts doing all the weird stunts alongside the actual models (including MJ’s moonwalk). The weird air earlier turns cheery with the audiences clapping and cheering for him. Even Director Hyun cancels her plan to tell the security to drag him down. Everyone applauds when he finishes his sudden walk on the runway, much to Seung-Il’s relief. A lady beside him even compliments his company and sends him flashing a smile (which I think is so cute). Jin-Wook, meanwhile, gives the super important bead to the designer and the fashion show is a success. So-Young is currently job hunting, feeling all positive. Unfortunately, she get turned down because : 1) she is older than the first company’s boss (which I find so unfair for her) and 2) she gets uneasy when the second company’s boss mentions about being trustworthy. She then sits alone at a park, looking at others with family members and lovers. Ahh..
At ‘the style’, Director Hyun is trying to get Seung-Il to hire a new secretary for himself. He refuses to do so and tells her that he will accept a new secretary only if one of the current employees resigns so that it will not affect the company. This makes her fuming with anger and she starts to talk to herself about the company and Seung-Il’s father, once being a secretary. Is there anything behind that? So-Young gets a job (finally) at a tailor shop, where the owner is a bit reluctant to hire her at first, but after she hears about her skills, she decides to hire her as a temp at first. So-Young is told to look after the shop while she goes out and for safety reasons, she holds So-Young’s ID card to avoid her from stealing or running away with things from her shop. Suddenly, her sister So-Jin calls and asks her about her whereabouts and her guess hits So-Young hard on her face : she has been fired from the company. So-Jin goes to the shop (with So-Young paying for her taxi fare when she arrives there) and starts asking for money. But then, she sees something more appealing in the shop : a branded jacket (which has the brand ‘CHANAL’, not ‘CHANEL’, though) and takes it away secretly while So-Young is entertaining a customer. This leads to the anger of the owner who accuses her being a thief. A cat fight happens with So-Young’s friend being involved in the fight too. She breaks the fight with her high-pitched scream and decides to hunt for her sister and the jacket. She asks around and gets to know her current position : at a club. She heads off to the said club to retrieve the jacket from her sister and clear her name. Jin-Wook arrives at a club with his friend and colleague, Manager Jang Ki-Hong (Hong Rok-Gi). He worries over his newly bought car, to the extend of interrogating the cowboy at the entrance about his driving experience. After being dragged away by his friend, they enter the club and start feeling in the vibe and pretty girls around them. Manager Jang sees So-Jin and asks her for a drink. She agrees when she sees So-Young starts looking and the jacket she is holding is passed to Jin-Wook for him to hold it. So-Young sees the jacket in Jin-Wook’s hands ans she goes to take it, or rather, grab it from him. They start to tugs at both ends of the jacket, while So-Jin successfully escapes herself from the scene and people starts to watch So-Young and Jin-Wook fighting. Somehow, Jin-Wook accidentally throws it into a gigantic wine glass filled with red wine and So Young tries to retrieve it. Unfortunately (this girl has no luck with her at all), she falls into the wine and everyone starts taking pictures. Some are pointing at Jin-Wook, accusing him for pushing her into the wine glass. He decides to help her out of the glass and things just get worse: So-Young’s causes the glass to topple down. Major catastrophe occurs : wine floods the club and damages the club, with customers running away. They are brought over to the office to meet the manager (who looks like a mafia, with his burly men). He is not that happy with what happened earlier and tells them that it will cost around 20 million Won to compensate the damage. So-Young accidentally throws up on Jin-Wook’s suit and off they go to the washroom together. While he nags about So-Young’s bad luck and things about her, he looks at the small window in the washroom. Something dawns on him: he can use this chance to escape from paying for the damage! He tries to make squat in order to make him escape first, but she talks into him, assuring that she will never betray him. At last, she is the one who climb on his back and escapes. She is pulling him up using the jacket when suddenly, one of the manager’s men sees her. Knowing that she will not be able to be safe if she tries to help him, she tries to ditch him away. 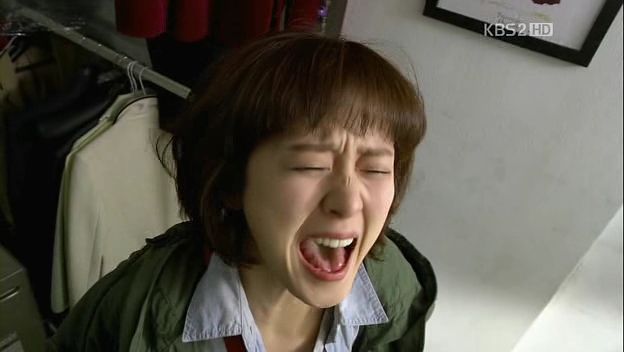 When Jin-Wook is strongly clinging to the jacket, So-Young resorts to her last method : pushing his head with her foot, and she succeed in her escape, leaving the poor, pathetic Jin-Wook lying on the washroom’s floor. He is the one who has to pay the whole 20 million Won to the club. The next day, there is a meeting going on in the company (about the loss in sale, something like that). Seung-Il is clearly not that happy with the news. 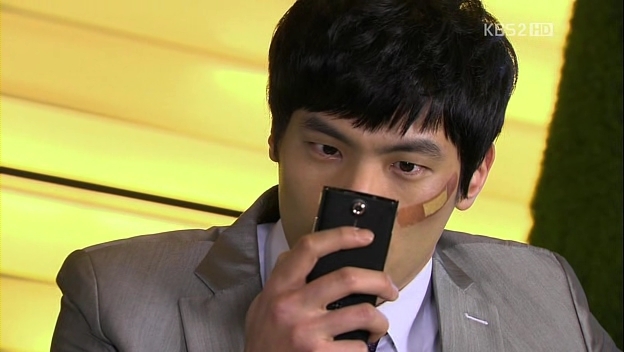 On the other side, Jin-Wook is texing his friend to ask for money. He does not pay any bit of his attention to the meeting. His happiness on his success to get the money is tarnished when he gets a video of him fighting with So-Young at the club. Angry at the top at his lungs, he curses so loudly until the meeting is interrupted and Seung-Il shoots him a death glare that could be radiating some laser. So scary. That day is clearly a bad day for Jin-Wook : he gets scolded by Seung-Il about his attire, further scolded by the person above him, and being frustrated to in debt because of another person. So-Young goes to meet the owner of the jacket, only to find out that the person is her ex-schoolmate, Ji Joo-Hee (Hyun Young). Seeing how successful her friend is right now when compared to her, she feels a pang of jealousy towards her. This gets carried on when So-Young picks up a fight with her sister later on because she is so furious with her. She is hurt, inside her heart, when her mother keeps being on So-Jin’s side, while she is the one who work so hard for the family and she storms out of the house. Later, she goes for a drink with her ahjusshi friend, Sun Nam (Park Chul Min). While they are drinking, he asks her, whether she have lied to others about her age using her face. He gives her something : a poster with her face on it. Looks like Jin-Wook makes a move first by pasting her photos all over the neighborhood and saying that she is a fraud and liar. He even got her age wrong on the poster. So-Young calls him and they argues. She cuts off the call and while he is fumbling his mobile to call back, he suddenly hit a car in front of him. You do have worse luck than So-Young, dear Jin-Wook. That night, So-Jin tells So-Young about her new part time job as a model. So-Young ignores it but she perks up when So-Jin tells her the pay : 1 million Won a day. It turns out that the next day, So-Jin is nowhere to be seen around the house and guess who gets to substitute her at the part-time job? So-Young reluctantly goes to the company in her place. That day, still, is not her best day. While she is running and trying to tie her loose skirt, she realizes that the lift is going to close and she tries to catch the lift. She runs and on the way to the lift, her skirt is stuck to a hanger and she is left with only her underwear on when she rides the elevator. Seung-Il, who happens to be in the elevator, is shell-shocked with the situation and So-Young cannot even hold her head up to face him. She is trying so hard to cover herself with her bag and he passes to her the magazine he is holding. When he goes up, she goes down to retrieve her skirt that have been picked up by a cleaner and ehds up in a bin. She is scolded because she is late even for the first day. At the parking lot, Jin-Wook is looking very sad because he is going to sell off his car to pay his debt. His first car that he bought with his own money is going to be taken away. He begins to lecture the new car owner about how he takes good care of his care, but gets ignored. Poor him, again. So-Young stills get scolded because she seems to lie about her height (they are basing this on her sister’s resume) and her flat chest. She is also ignored by others and being left out. She takes a look at a design of the clothes at recalls her younger days, where she once dream to be a great designer, only to have her dreams shattered into pieces when his father left her family with the debtors chasing her family. Because of that, she could not further her studies and had to work. Suddenly, she gets another bad news: So-Jin was actually bluffing about the pay. It is only 300 000 Won per week with side jobs along with the modelling. 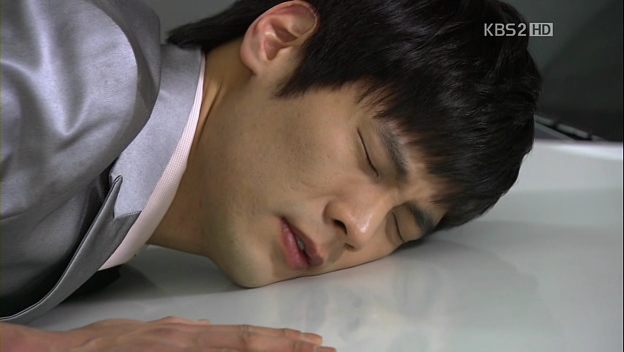 Jin-Wook and So-Young are so close to meet each other, but it is not the time yet. When Seung-Il and Director Hyun suddenly come into the design department, both So-Young and Seung-Il recognize each from the elevator. He looks at her and says, “Are we making children’s clothes?” That is so ruthless, Seung-Il. Everyone is called into the meeting room and So-Young goes to make coffee for the rest. Jin-Wook goes into the department and sees something that is so interesting : the long legs that belongs to a lady wearing a short yellow dress who is struggling to carry a heavy water bottle. He turns on his gentleman mode and tries to help her, only to finally gets to see the person that he really wanted to see: So-Young. Life will not be easy for So-Young as she encounters Jin-Wook and he will not let her go so easily. But then, his life will not be all roses, either.